One of the best things about YouTube is how so much weird archival footage there is available. If you remember a show, half-remember a show, or even have never heard of a show, you’ll likely be able to find at least one episode of it. Barring that, someone talking about it. Just Monday, Kyle Kallgren did a video about Behind the Scenes, a Penn and Teller-hosted kids’ show about art. That said, today’s topic isn’t as classy as Behind the Scenes. Instead, we’re going to talk about the bizarre 1979 CBS daytime game show Whew!. The official Wink Martindale YouTube account posted a pristine print of an episode of Whew! a few years back — you can watch it below — which is odd, since as far as I’ve been able to tell, he had nothing to do with the show. He doesn’t host — that’s Tom Kennedy — and I haven’t seen him listed as a producer, but for whatever reason his account posted it, I’m glad it did. The show is strange. The animated title sequence (by Hanna-Barbera) shows a woman going through a row of increasingly dangerous bad guys — mobsters, vampires, pirates and the like — to get to the end and exclaim the show’s title. But what continues isn’t nearly as exciting as the title sequence implies. Firstly, there’s the title — Whew!, which is not pronounced as someone saying “Whew!” Instead, the official name is pronounced as an actual sigh of relief, which is transliterated closer to “Psshewwsh.” And, like all good game shows, the audience is inspired to shout the name of the show in the welcome and sign-off. There’s just one problem — it’s nearly impossible to shout “Whew!” The audience sounds more quietly confused if anything else. Confusion almost seems like the theme of the show. The main game is a bit too complex — but I’ll explain the best I can. (It took me until the first ad break to work it out.) There are two players, a “Charger” and a “Blocker.” The Charger goes off-stage while the Blocker chooses six squares on the game board (shown below) to block. The Blocker can places as many blocks on each row as they want, except for on the sixth row, where they can only place one. After the blocks are placed, the Charger comes back on-stage. They have to work their way up the board from Row 1 to 6 in 60 seconds. The Charger can choose any dollar amount on that level, where they’re asked to correct a “blooper,” the game’s style of question. Have you ever watched Match Game? The bloopers are like the Match Game questions, only with the blank already filled in. The answer is what the correct phrase should be. (For example, the blooper might be “Four score and seven weeks ago,” and the answer would be “years.”) If the Charger corrects the blooper, they can go up to the next row; otherwise, they’ll have to choose another dollar value from the same row and try again. If the Charger hits one of the aforementioned blocks, not only do they have to choose again, but they have to wait five seconds before choosing. The Charger can also take the “Longshot” option, where they can advance directly to the sixth row. If the Charger gets through the board and correctly answers the sixth-row question, they win, otherwise the Blocker wins. The Blocker also gets the dollar value of any blocks the Charger hit. The Charger doesn’t have to make a connected path through the board, they can choose whichever squares they want. If that sounds like a lot of rules, that’s because it is — and I’m even leaving out some details. If someone won two rounds, they got to advance to the bonus round, The Gauntlet. (Not that Gauntlet.) The stage reveals life-size cutouts of the characters from the intro sequence made of plywood. Each has a window in their chest revealing the top third of a TV screen. 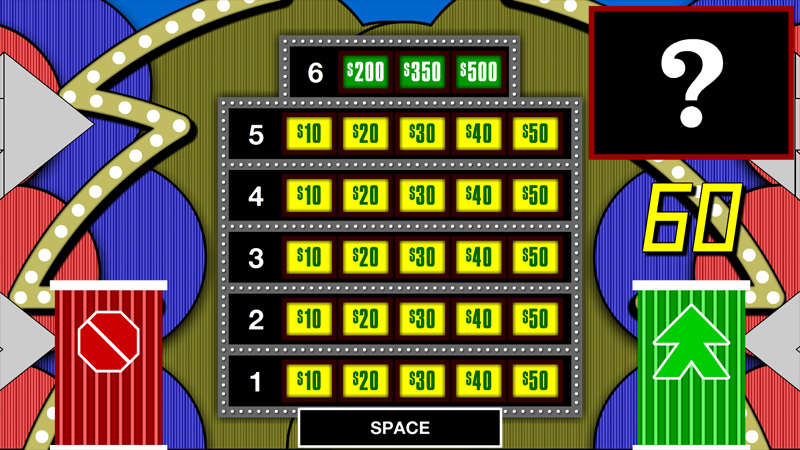 Each cutout acts as a level, and the goal is to get through all ten to win $25,000. (Just shy of $100,000 in today’s money.) The questions are the same types as the bloopers from the main game, and if the contestant gets the answer wrong, they stay at that character until they get one right. Watching Whew! is quite odd. It seems they really wanted to make it a thing; the Hanna-Barbera animation is quite nice, and the set has a lot of bells and whistles that make it look a little more expensive than many shows. Not to mention that the final prize is a pretty good-sized chunk of change. $25,000 would be impressive in today’s dollars, let alone the amount adjusted for inflation. But it’s sunk by a confusing game, an unpronounceable title and, worst of all, the fact that the bloopers themselves try a little too hard to be funny without actually going there. But it’s all these things that make Whew! worth checking out — they tried for a lot of things, and even though it didn’t really coalesce into a great product, it’s more interesting than a lot of stuff I’ve seen.